MA program in Financial Economics provides opportunities for students to enter the Fintech world. The third cohort of the students in a Master's program in financial economics graduated this May. Graduates from the program from the past three years are working in Israel and abroad and are represented in companies such as Bloomberg, Citigroup, Microsoft, Barak Capital, Strauss, Elbit, Deloitt, Ernst and Young, Bank Leumi, The Israeli treasury department, and the anti-trust authority. Four graduates went to pursue their PhD in universities abroad: UCLA, London School of Economics, Pompeu-Fabra University and Stanford University. 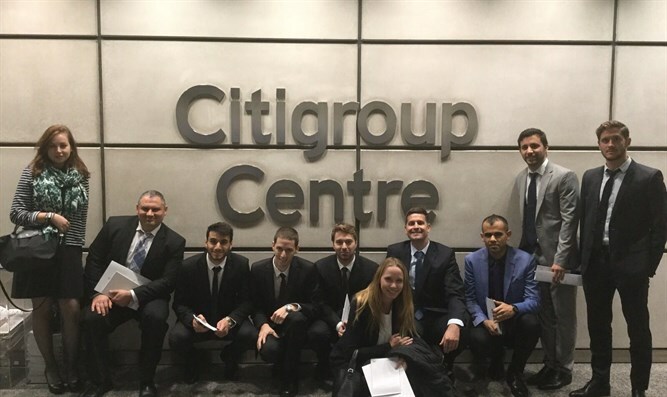 In November, students from the Master Program in Financial Economics visited London's financial center. During the trip, students were introduced to the global financial system. The trip provided an opportunity to relate the studies to the real world and deepen the students' understanding of how financial institutions work and the decisions and tasks they face. The visit included meetings with senior executives in leading global banks and investment institutions. The meetings included, among other things, case study analyses, simulations, trading floor tours, introduction to the job market process, company presentations, and networking. The MA program in Financial Economics provides opportunities for students to enter the Fintech world. Students who are interested in Fintech can take elective courses in Fintech and Python programing. They are also given opportunities to collaborate with master students from the MBA Big Data program and work on Fin-tech projects. To learn more about the MAFE program, click here.